Can an advocacy organization redefine itself to not just win campaigns but also empower people to self-organize for a sustainable society at all levels? Greenpeace Spain has been on the path to answering that question. Here’s the story. 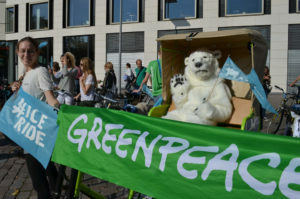 In recent years, Greenpeace Spain has been integrating mobilisation and people-powered campaigning into the organization. Explaining this shift, staff point to a need to not just win campaigns but to change how people view sustainability and their role in it. An organization can stop a development or change a law but the impact is temporary unless all sorts of behaviors and choices change, too. Moving from staff-led campaigns to people-powered campaigns supported by the organization has meant continual learning. Staff have shifted positions. Everyone found out about the power and value of data. Leaders have been tested to stick with staff and find opportunities to test new ideas in safe ways. Spain’s national economic situation recently forced the organization to cut staff – a painful, unplanned move that has tested the organization’s ideas about the power of mobilisation and people-powered campaigning. In 2004, GP Spain brought together all staff that worked directly with citizens by creating a Participation Department. Education and volunteer roles were pulled in, as was the Actions team (a group responsible for on the ground events and non-violent direct actions). Figure 1 below illustrates the structure at that time. Figure 1. Greenpeace Spain in 2004. All teams with supporter interaction (excluding fundraising) were pulled into an integrated Participation Department. This created consistency of approach and message when it came to recruitment, education and engagement of people. More people were brought into contact with the organization and its staff. Relationships were more direct and personal. There was a shared emphasis on developing and implementing direct engagement strategies. Multiple databases. Volunteers had a list. Fundraisers had a list. Actions staff had a list. A cyberactivist list was growing as more people took action online. Siloed data created multiple communications strategies. It also meant that staff didn’t have shared metrics or performance goals. Maximizing email fundraising results may not support volunteer engagement, for example. Growth of online communications and lists. 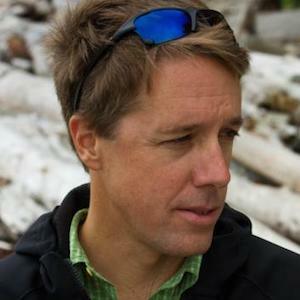 Fundraising and list-building became a largely online endeavor for most organizations by the mid-2000s. Lists were growing but personal connections to (and communications with) supporters were declining. Digital communications also changed the pace of interaction and shifted expectations of accessibility and transparency. The need to understand digital communications and mobilisation affected all parts of the organization. In 2010, GP Spain began a series of structural changes to emphasise mobilisation and better share internal data and strategy development, support citizen education and engagement, and mobilise more people at more levels of society. Leaders and staff recognized that email, social media, direct mail, mobilisation and volunteer managers were not contacting their own unique lists. Instead, these lists and groups of constituents were facets of a single supporter group. But multiple databases and separate teams meant supporters were hearing too many messages (or too few), or not the right messages, or conflicting messages. If you’re an interested but really busy person do you want to engage with an organization that isn’t clear about what you can do and understands your needs? No. Figure 2. 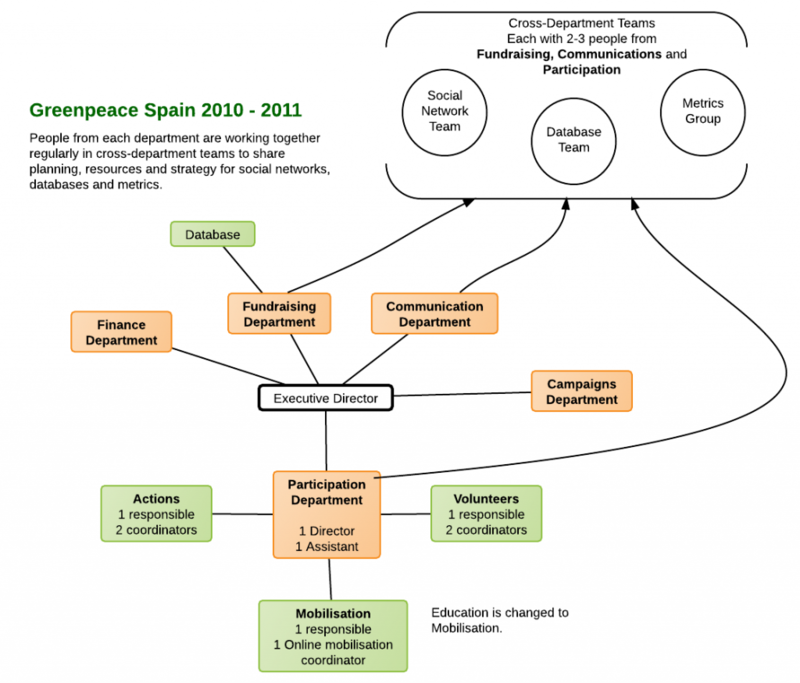 In 2010, Greenpeace Spain created several cross-department teams to increase collaboration, improve mobilisation strategy and break down internal silos. This cross-department integration was intended to improve overall supporter engagement with the organization. Online and offline metrics were shared for the benefit of every team. This was also the point at which the organization began looking at the costs and benefits of pulling multiple databases together (the member database, cyberactivist database and leads databases). Setting up and running cross-department teams helped create shared goals, metrics and strategies. It also cast a bright light on the power of data. Siloed data reinforced staff silos and acted as a barrier to information sharing and cross-department planning. By early-2012, GP Spain had completed a long but critical database integration process. Staff teams and senior leadership invested in database integration to support a culture that focused on supporter’s needs in the change-making process, not the needs of staff. Database integration included member lists, cyberactivist (online) lists, and leads (names gathered at offline events, on the street and elsewhere). By early 2013, this database will also include volunteer roles (activists, youth, trainers, etc.). Data integration took about a year to complete. A cross department team of five managed the project, representing database staff, fundraising, and both online and offline mobilisation. Today, a two-person team manages data. This team includes a database coordinator and online fundraiser. They coordinate continually with other departments, particularly mobilisation and digital — a legacy of the cross-department teams created in 2010. Database integration has had powerful results in Spain. Each part of the organization is able to contact more people and the rate of supporter growth has increased. Questions about how many emails are sent per week – and to whom – are resolved in a collaborative rather than competitive manner because there is shared understanding of the data, its purpose, and how each part of the organization uses it. The takeaway: Data is power. Share data to grow power. Siloed data prevents collaboration and weakens the potential power of an organization. The role and significance of digital in campaigns has changed rapidly in recent years. Email lists have grown and social media is a valuable channel for communications and engagement — but only if online strategies are shared across the organization. Unique online programs for fundraising, actions, volunteers, campaigns and more were stifling mobilisation growth. Figure 3. 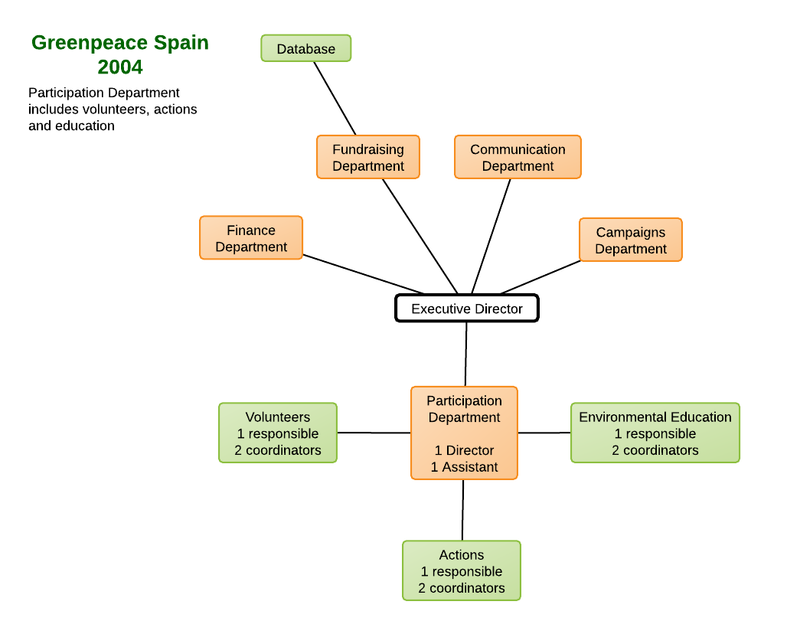 By early-2012, Greenpeace Spain had integrated several databases and created a cross-department “Online Group” – merging earlier cross-department teams – to better collaborate on digital strategy. The online group brings together online and offline mobilisation staff, fundraisers, web staff, and database professionals. This is recognition that everything that happens online – web pages, action campaigns, fundraising messages and more – touches supporters with engagement opportunities. This helps bring online communications to the front end of fundraising, mobilisation and volunteer strategy, instead of coming in at the end with news that staff need a site, a web page, a form or other online tool. One of the biggest challenges to any organizational change is the time involved to “get it right.” Staff are asked to work with new teams and take on roles they may not recognize. 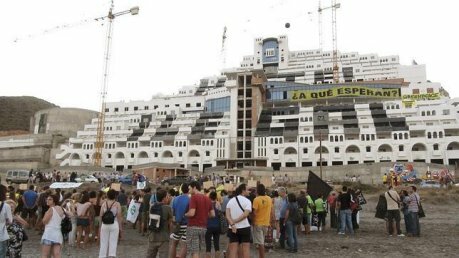 In Spain, mobilising people meant moving staff (and even volunteers and citizen leaders) out of a comfort zone. Consistent leadership, shared data, and trust-building through cross-department teams helped put GP Spain in position to test people-powered mobilisation projects. Earlier this year, we wrote about one of these projects, a campaign against a large hotel complex in a national park. The hotel campaign included a significant mobilisation of volunteers, activists and staff to be at the hotel, hold signs and candles, hang massive banners across the building and participate in follow-up mobilisations presenting signatures to the president and more. This was the first large-scale mobilisation campaign under the new structure and an opportunity to build trust, use new collaborative practices, learn about one another and test co-creation ideas involving colleagues and volunteers. A significant amount of organizational change has happened at Greenpeace Spain in the past decade, especially in the past two to three years. Consistent, supportive leadership has played a big role in guiding the evolution and keeping it going. There were at least two levels of leadership involved. At the international level, multiple changes were happening to support people-powered mobilisation work and better integrate international and national campaigns. At the national level, a participative planning process identified key shared organizational goals that drove the 2010 changes. Organizational leaders were more able to invest in shared goals developed by people from all over Greenpeace Spain (board of directors, staff, senior management team, volunteers, youth and others). Supporting movements that were more participatory and reinforced the benefits and values of activism. Developing and supporting internal leadership, managing knowledge and data, integrate planning and strategic decision making. An integrated database supported these shifts in planning and strategy. Establishing stronger local influence through more stronger volunteer networks and more volunteer conceived and driven activities. This included developing local leaders and establishing trust. We were really ready for this change. We have done a lot of work, face-to-face work but when we got the approval from the SMT (national) to create the mobilization unit. It was because we had done the work. The head of our unit was a social champion for a long time. This was not a top-down process. Staff participated in internal planning and goal setting. Staff recognized silos, identified opportunities for change, and proposed solutions like cross-department teams. Leadership provided resources for testing and guidance on how to learn from both failure and success. 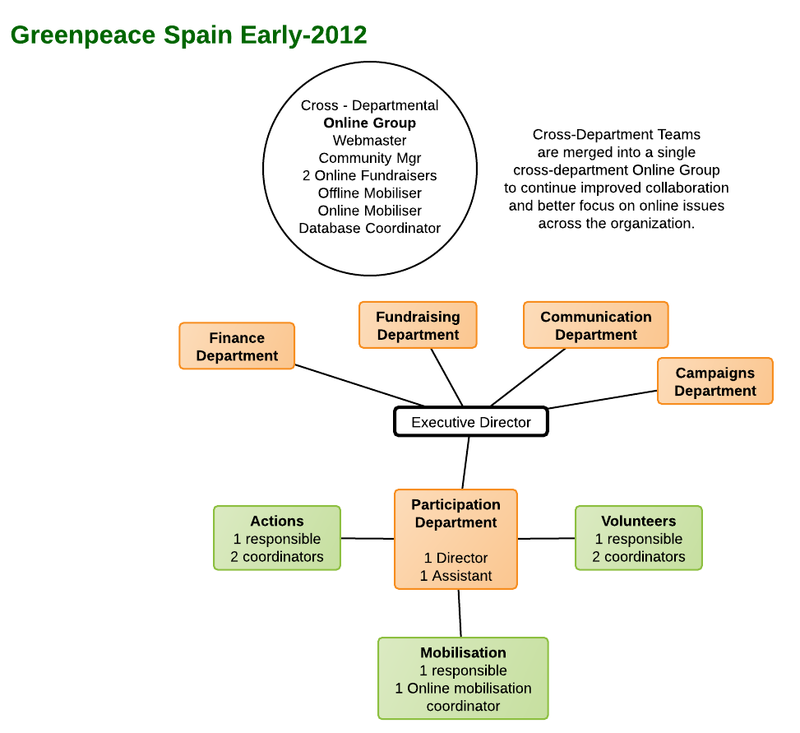 At Greenpeace Spain the role of senior management was not to plan, strategize and then dictate implementation. Instead, leadership focused on setting vision, empowering staff, and enabling everyone – staff, board, volunteers, supporters – to play a meaningful role. By July, 2012, the national economic situation in Spain had taken a toll on Greenpeace Spain. At least 16 positions were cut and significant restructuring followed while the organization tried to adapt to a smaller budget. Interdependent leadership and strong volunteer roles developed in the previous 10 years have helped the organization maintain most of its workplace. Volunteers have taken on leadership roles and the staff are focusing, in part, on developing more and stronger regional leadership among supporters and volunteers. The organization is continuing to identify constituent leaders and designing better training programs as it further distributes responsibilities. Staff are collaboratively partnering with citizen and volunteer leaders to create these new programs and structures. We want to thank everyone at Greenpeace Spain for their efforts and offer special appreciation to Eva Saldaña, Mobilisation Director, for her answers, clarifications and support while putting together this story.